On Friday, 9th November, students from Belle Vue Girls’ Academy, in conjunction with Historic England, devised an interactive experience to commemorate the centenary of the Armistice. Teachers and students from Music, Art, Drama and English have explored the significance of the arts in how we remember war and have collaborated to create an immersive experience which sought to explore the act of remembrance and commemorate the changing roles of women during and after the Great War. 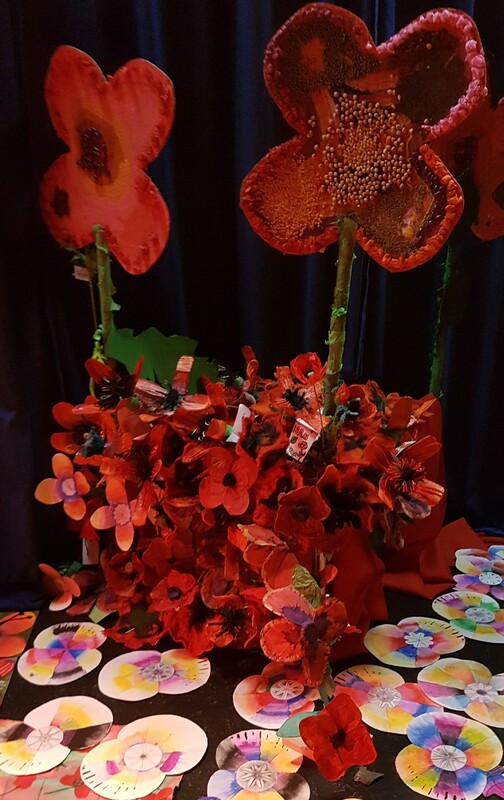 The installation featured over 1200 poppies, individually made by every KS3 pupil in the school; a student response to Gustav Holst’s “Mars” from the Planet Suite; student-devised drama; poetry and creative writing. Students from all year groups passed through the half hour installation, which was repeated ten times throughout the school day. The day before the installation, with funding help from Historic England, all students in Year 8 watched the one-woman play “Words, Women and War” by local writer and actor Irene Lofthouse. Some students then worked with her to devise a creative response to her play which became part of the installation the following day. The WW1 Centenary project is part of a wider programme working with Historic England aimed at developing young people’s knowledge and understanding of their local heritage and how this connects and informs their relationship with national and global events. The school is hoping to become the first high school in West Yorkshire to achieve the prestigious National Heritage Schools Award.